Today is the day, Watchers! It's been nearly 17 months since we launched our Fig campaign and showed: Pillars of Eternity II: Deadfire to you all for the first time. This is our first sequel to one of our own titles – and our first followup in a series. We've learned so much and been able to improve so much, thanks to your help. We couldn't have imagined that the response to the announcement of Deadfire would be what it was – you helped us fund the game even faster than we did Pillars 1! For that, and for your continued support, thank you. Along the way, we hit stretch goal after stretch goal. We discussed multiclassing (and went over the changes to that system later on). Of course, we delivered our take on an all-new companion relationship system, in part due to community request. We showed you the ship that that would be your home base and your means of travel around the enormous Deadfire Archipelago. We even had a portal to the puppet universe open to explain how the ships worked. You also proved that our design decisions were right by helping us fund Pillars II higher than our original campaign for Pillars of Eternity! We're still stunned and incredibly grateful to have such an awesome community backing us. Everything we put into the game you're about to play we did with you in mind, first and foremost. The road to Eternity started back on September 14th, 2012 and now six years later, we're here with the biggest, deepest, most incredible Pillars journey yet, but we aren't done! We'll continue to bring you updates post-launch and keep you notified of any news that is happening with Deadfire and the upcoming DLCs – which, by the way, are shaping up to be amazing, as well. What is a launch without a launch trailer? We're happy to share the official Pillars of Eternity II: Deadfire launch trailer! If you haven't done so yet, don't forget to manage your pledge on the Eternity Backer Portal so you can access your copy of Pillars of Eternity II: Deadfire! Once your pledge is linked, go to the Products Page of your account and generate the Deadfire key for your preferred platform, Steam or GOG. Once you have the key, enjoy! Browse here for detailed instructions on how to complete your pledge. On that same Products Page where you get your Pillars II key, you'll also find any digital rewards that you may have with your pledge tier. We do want to do some special call outs for two of the items, though. PnP Start Guide - The Pillars of Eternity PnP Starter Guide is being released in an early state of the game's development and we would greatly appreciate your feedback while you try it out at home. For anything you'd like us to know about the Starter Guide, please send feedback to feedback@obsidian.net. Pillars of Eternity II: Deadfire Novella - The novella is coming together, but isn't yet ready for primetime. We don't expect the delay on this item to be too long and will update everyone as we have more information! Bring Vox Machina into the world of Eora with this free DLC pack! 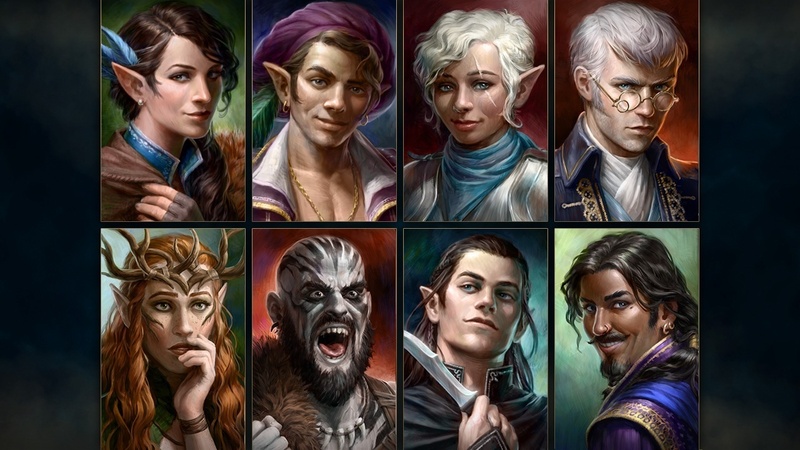 This pack will bring player voice sets and character portraits for the characters popularized in Critical Role's first campaign. The DLC pack is available now for download through Steam, GOG, and Origin! We are very happy to share with you the main theme from Pillars of Eternity II: Deadfire. Composed by Obsidian Audio Director, Justin E. Bell, get ready to set sail into the Deadfire with this fantastic piece! We're so honored that so many critics are as excited about Pillars II as we are! WIRED - That’s what makes Deadfire so special. All kinds of actions, from big to small, can echo throughout the handcrafted map, leaving you to deal with, and adapt to, the consequences. We hope you all enjoy your time in Pillars of Eternity II: Deadfire. If you have any issues, please head over to our new support portal to help you on your journey. Did you miss our last update? Check it out! Edited by Nanawatzin, 08 May 2018 - 02:17 PM. Any news about integration of scavenger hunt for GOG version? It will be really sad if we get the items at a time when they will be worthless for our high lvl characters. It's real now... TY ! Edited by Silent Winter, 08 May 2018 - 06:46 PM. Congrats Obsidian! And thanks a lot for all your hard work! And thank you for being!!! I'm hyped, but can't play it right now due working schedule. Trying to avoid any spoilers, so probably will not visit forum for some time. Congratulations with release of Deadfire though! There's an upside to this, though: you'll get to enjoy the game after the first batch of tweaks and fixes, so it all balances out in the end. From the bottom of my heart, THANK YOU OBSIDIAN!! Don't ever stop making amazing RPGs like this. I will gladly pay multiple times retail value for games like Deadfire. I’m so happy to have been a backer to both Poe and PoeD. And thank you to Obsidian and to all the employees for two great games. THANK YOU!!! I've opened the new game link through fig and GOG. Not much seemed to change (I do see new godlike heads ). There didn't even seem to be anything to update on GOG galaxy. Nothing happens when I click "Create New History," I don't see any DLC goodies in my inventory, and I'm back on the beta island talking to the same stranded merchant. Does all of the new stuff kick in as we go along? Is there something else to do to update? EDIT: single account refresh will work, please avoid refreshing the account multiple times. There is a slight lag due to the sheer amount of requests, but we are working on speeding things up. EDIT2: If after refresh and you are using Galaxy Client and on your shelf you have any other version than "Pillars of Eternity II: Deadfire", try buying free DLC for POE2 through the Client. That should force client cache refresh. Edited by Silent Winter, 09 May 2018 - 05:09 PM. Managed my first play this morning before work (actually booted it up when I got home last night but didn't even get as far as character creation before my baby daughter demanded attention - luckily she had a nice lie-in this morning). Edited by Silent Winter, 10 May 2018 - 12:22 AM. Thanks! I will try this tomorrow and roll into a new game in some days. PS: Disclaimer - I only use Galaxy to download. I disable most of it. PPS: Not surprised by your compliments about sound, etc. Their ittle touches are often as big a deal as the rest. Can't wait. It's quite playable even now, so I'm pretty happy about that. But I'm going to do like I usually do and wait for a few patch cycles before I delve too far. Thanks Obsidian, this looks like it's going to be a lot of fun.